As we've previously announced, 100 Bands will thankfully be returning this year for their third, jam-packed installment! With a first wave announcement revealing acts such as Wormrot, I Am David Sparkle, Plainsunset, Cashew Chemists, Force Vomit and more, excitement has already been building for the three weekend festival. And with the first weekend fast approaching, THE RSC and The People's Association have finally revealed this year's off-the-beaten venue (after 2014's Kovan Hub Bus Interchange and 2015's Bedok Reservoir) in The Open Field opposite Paya Lebar Airbase! This year's festival will also be incorporating a bazaar of local entrepreneurs, chefs, crafters, artists and vendors aptly called The Tuckshop. Made up of booths such as The Lab (burgers and sodas), Encik Rizal (Western and Muslim food), Allison Marie Low (illustrated prints), Magpie (magazines), Nidiamarssa (photograph prints) and much more - this local-only bazaar is totally in keeping with 100 Bands' community spirit. In addition, we've also just received news of an updated line-up with a whole second wave of confirmed acts - including notables such as A Vacant Affair, Generation 69, Moods and plenty more. For the updated list of acts, please follow their official Facebook page. 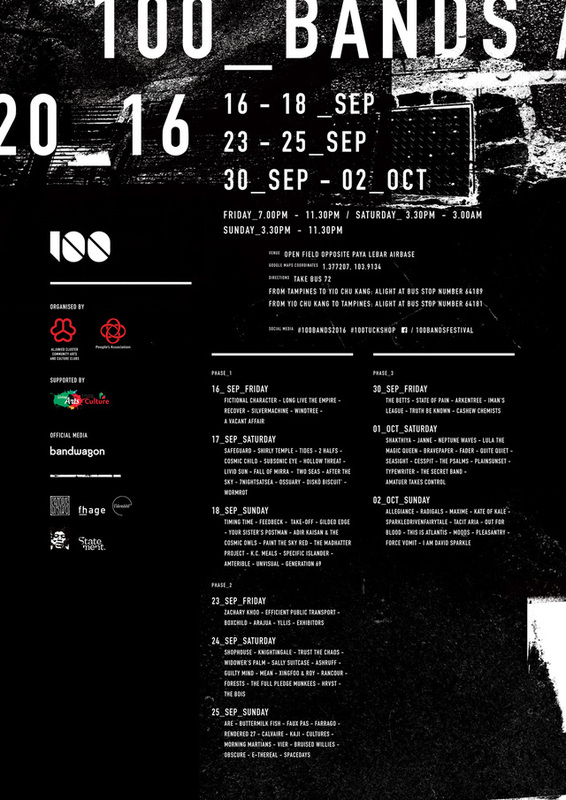 Watch the video teaser for this year's 100 Bands Festival by fhage below.